One of the most fun things I’ve gotten to do with my husband is introduce him to all the foods and cuisines I know and love. Mexican has been particularly enjoyable as Mexican foods are hard to come by in Latvia. There is a brand named Santa Maria from Sweden, I believe, that is sold throughout the Baltics. They do tortillas and taco shells, some very basic salsas and mixes, that type of thing. They also do lots of spices and some really fantastic mixes I’ve had difficulty replicating here. Unfortunately, their Mexican selection is just not that good. Nor are tomatillos or mild but large chili peppers easy to find, especially in winter. When we got to the US, many of the first places we went to were Mexican. Places like La Frontera (a Utah tradition) and Chipotle (can’t be beat for fast, fresh and cheap food), etc. I found I had a lot of ‘splainin’ to do when it came to the menus, too! After trying different burritos, enchiladas and tamales, he asked me what there was that was more veggie-based than tortilla- or meat-based that I could make for dinner that week. That was easy: “Chile Rellenos,” I said. I’d had them at El Palomar in Santa Cruz and thought they were pretty good. At the time, I didn’t realize that chile rellenos are often deep-fried and not stuffed with rice and chicken like I thought would be tasty. I started researching it a bit and created a recipe that would suit our desires to limit the amount of meat used, increase veggies and still be filling and delicious. 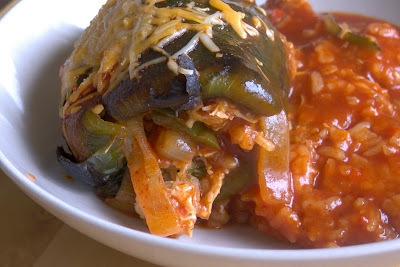 This is probably nowhere near a traditional chile rellenos recipe, but I promise, it is delicious. It doesn’t need much chicken to be satisfying, 4 ounces, or half of one typical chicken breast, is enough for two to three people. A pepper, plus the rice it rests on will be plenty for a meal for one. All of it can be made up to a day ahead and assembled just before dinner. Place peppers on a baking sheet or broiler pan and broil, turning every five minutes until the skins are blackened and blistered, about 15 minutes or so depending on your broiler. Remove from oven and drop peppers into a paper bag, closing tightly. Let rest at least 10 minutes before opening. Peel off the skins and remove stem and seeds so the peppers can be stuffed. Set aside. Over medium low heat, saute onion slices and garlic in oil. Add a bit of salt and cook until onions are soft and turning golden. Remove to a bowl. Sprinkle chicken breast with salt, pepper, chili powder and oregano (all to taste), and saute for 5 – 6 minutes or until cooked through. Remove. Shred chicken using two forks and remove to bowl. Add 3/4 cup of shredded cheese to bowl, along with cumin, chili powder, salt, pepper, garlic powder, oregano and 3/4 of fresh cilantro. Add approximately 1/2 – 3/4 cup of the cooked Mexican rice. Mix together well. Place remaining rice in the bottom of a 1.5 qt casserole dish. Open each pepper and stuff full of the chicken mixture, then place atop rice. Pour over enchilada sauce, sprinkle with remaining cheese. Bake at 350F for 15 minutes to warm through and melt cheese. Sprinkle with remaining cilantro and serve. Using a food processor, finely chop carrot, bell pepper, 1/2 yellow onion, 1 tomato, and 2 cloves of garlic. Over medium heat, saute mixture for about 3 – 4 minutes. Add the mixture to the rice and water in a rice cooker and cook according to manufacturer’s directions. This entry was posted in chicken, gluten-free, mexican, recipes, rice, untranslated. Bookmark the permalink.